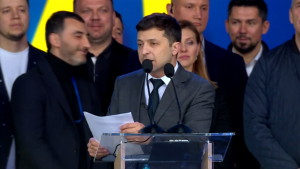 Ukraine sends out a symbolic solitary athlete, and Vladimir Putin shares a glass of champagne with the IOC president – this is what happened in Sochi. Biathlete Mykhaylo Tkachenko of Ukraine bears the flag as he enters the stadium during the opening ceremony of the Sochi 2014 Paralympic Winter Games. 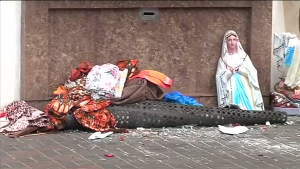 Ukraine sent 31 athletes to the games in Sochi but only one athlete participated in the opening ceremony. Tkachenko was met with a huge cheers as he entered the stadium. Ukraine’s Paralympic chief Valeriy Sushkevich earlier warned his team would quit the games if Russia invaded his home country. Russia is holding the games in the Black Sea resort of Sochi at a time when it is being criticised for its actions in Ukraine’s southern region of Crimea, where the west accuses Russia of seizing military and government institutions. 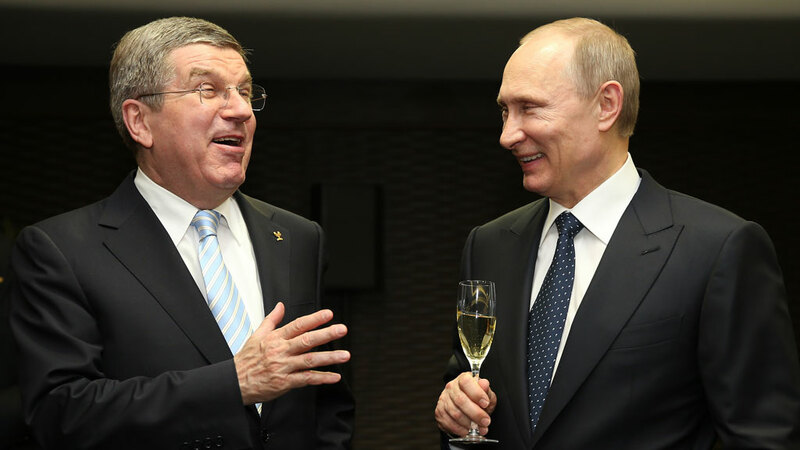 Thomas Bach, the president of the International Olympic Committee, shares a glass of champagne with Mr Putin prior to the opening ceremony. 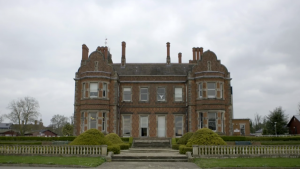 Many countries cancelled plans to send government ministers and members of royal families to the games because of events in Crimea, where the parliament has voted to join Russia and hold a referendum on its status on 16 March. 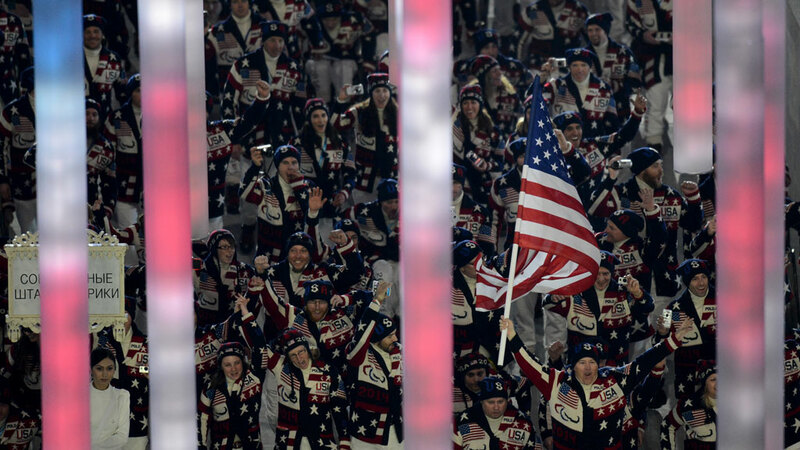 The US delegation enters the Olympic stadium during the opening ceremony. Earlier on Friday Mr Putin spoke on the phone to US President Barack Obama for the second time in six days, but the pair remained far apart over Ukraine. 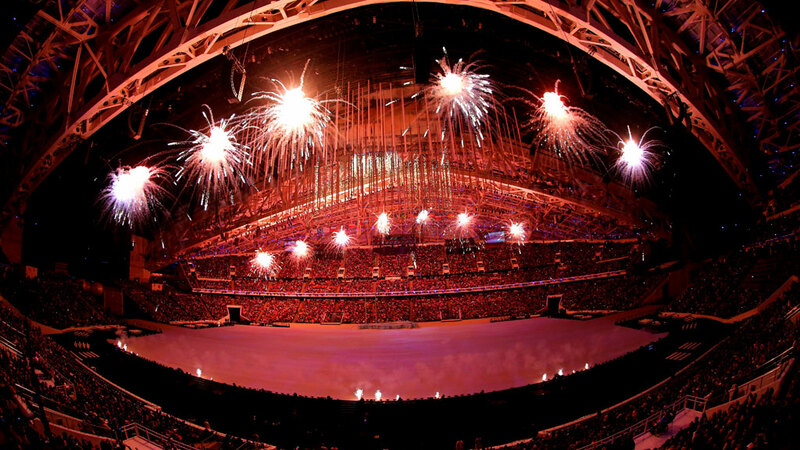 Fireworks mark the beginning of the opening ceremony of the Sochi 2014 Paralympic Winter Games at Fisht Olympic Stadium. 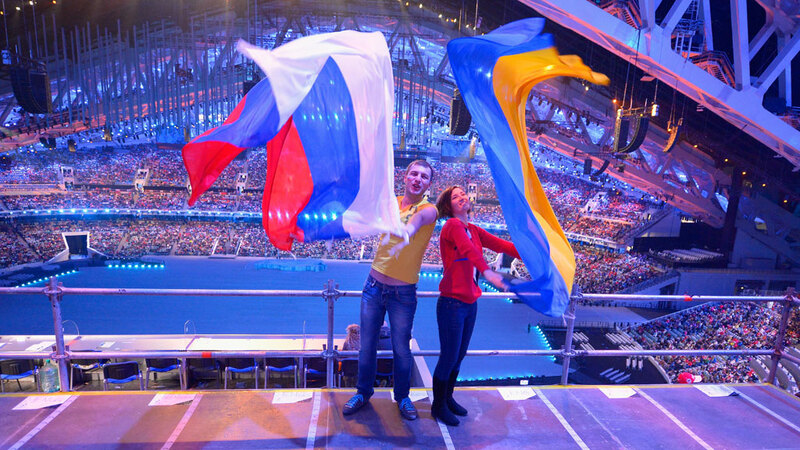 Spectators pose with Russian and Ukrainian flags at the opening ceremony. With the eyes of the world turned on Ukraine and Crimea, the 2014 Winter Paralympics opened across the Black Sea, in the Russian resort of Sochi.